Boston 1775: When Did We Start Saying, “The British Are Coming”? Who Tipped Off Samuel Adams? What Did the British Officers Inquire About? The First Detainees of the War? When Did We Start Saying, “The British Are Coming”? Most people who have read some Revolutionary history probably know that already. It’s a well-known myth, like young Washington chopping down the cherry tree or Abner Doubleday inventing baseball. Nevertheless, more people are probably familiar with the mythical phrase “The British are coming!” than with what Revere and witnesses recalled him actually saying. The question Gretchen posed was: When did that famous phrase first appear in accounts of the Concord alarm? It doesn’t pop up in my usual round-up of primary-source material that can be searched online (links to the left). It doesn’t appear in the America’s Historical Newspapers database until well into the 1800s, and not in connection to the outbreak of the Revolutionary War until many years after that. Gretchen had found what, as far as I can tell, is indeed the earliest use of the phrase, and it came from someone who was definitely at Lexington when the alarm began. However, that person didn’t say she’d heard the words from Paul Revere. On 21 Nov 1822, a Boston man named William H. Sumner dined with Dorothy Scott, the widow of John Hancock. (After the governor’s death, she had married a second time to one of his ships’ captains and moved to New Hampshire.) Sumner heard such interesting stories that he went home and wrote them down in a “Memorandum” that was published in the New England Historical and Genealogical Register in 1854. In April 1775, Dorothy Scott was still Dolly Quincy, Hancock’s young fiancée. 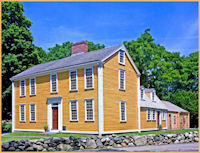 She was staying with him and a large party (also including his aunt and Samuel Adams) in the parsonage at Lexington (shown above, courtesy of Battleroad.org). Revere and William Dawes arrived with a warning that troops were marching from Boston. (Those troops weren’t coming for Hancock and Adams, but that’s a separate myth.) After a great deal of trouble, the Hancock-Adams party finally left for Woburn. [They] were just sitting down to it [dinner], when in came a man from Lexington, whose house was upon the main road, and who cleared out, leaving his wife and family at home, as soon as he saw the British bayonets glistening as they descended the hills on their return from Concord. Half frightened to death, he exclaimed, “The British are coming! the British are coming! my wife’s in etarnity now.” Mr. H. and Mr. Adams supposing the British troops were at hand, went into the swamp and staid till the alarm was over. No men in that anecdote come across as very courageous, do they? My father [Samuel Lawrence] belonged to a company of minute-men in Groton, at the commencement of the Revolution. On the morning of the 19th of April, 1775, when the news reached town that the British troops were on the road from Boston, General [Oliver] Prescott, who was a neighbor, came towards the house on horseback, at rapid speed, and cried out, “Samuel, notify your men: the British are coming.” My father mounted the general's horse, rode a distance of seven miles, notified the men of his circuit, and was back again at his father's house in forty minutes. In three hours the company was ready to march, and on the next day (the 20th) reached Cambridge. Amos Lawrence was born in 1786, so he had no direct knowledge of the start of the Revolution, but his father lived until 1827 and could have told this story often. There are also incidents of the phrase being used later, such as when the Revolutionary War moved to New Jersey, and in the War of 1812 at Connecticut. It made sense for Americans to shout, “The British are coming!” after the population had broken with Britain and defined themselves as not-British. And since all our stories describing people saying, “The British are coming!” date from after the War of 1812, we have to consider whether people might have projected the language and outlook of that period back onto the start of the Revolution. With some more online searching, it’s possible to trace the spread of “The British are coming!” from Dorothy Scott’s anecdote. Frederic Hudson’s “The Concord Fight,” published by Harper’s in May 1875, accurately picked up what William Sumner recalled hearing. That same article quotes riders from Boston warning, “The Regulars are coming!” before the first shots and the British retreat. That put both phrases into an authoritative, nationally distributed publication. N. S. Dodge’s Stories of American History Teaching Lessons of Patriotism, published in Boston in 1879, has Paul Revere telling a sergeant guarding the parsonage at Lexington, “you will have noise enough before long; the British are coming.” Thus the phrase got into Revere’s own mouth, and into a schoolbook. After that, we were stuck with the phrase. TOMORROW: One witness’s statement of what Paul Revere actually said.